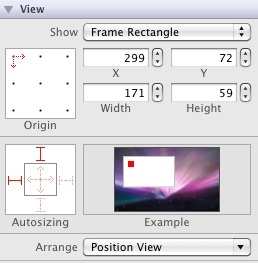 If you have ever developed an application using a user interface toolkit for a windowing based desktop system (be it Windows, Mac OS X, Linux, Qt or GTK+) you will likely be familiar with the need to design your user interfaces such that they resize appropriately when the user enlarges or reduces the size of a window. This generally involves deciding which visual components of a window move and which ones resize to accommodate the containing window. Obviously iOS based devices such as the iPad and iPhone do not have windows that the user can resize in the conventional sense that we are used to in the world of desktop applications. The iPad is, however, sensitive to physical rotation, providing the option for a running application to be displayed in either portrait or landscape mode. Given this capability, it is essential that an iPad application user interface layout adapt accordingly should you decide to support different device orientations within your application. In this chapter we will look at the mechanism for enabling rotation and modifying the layout of user interfaces within an application. In the course of this chapter we will be talking about concepts such as the view, superviews, subviews and view hierarchies. If these concepts are unfamiliar to you we recommend first reading the chapter entitled Understanding iPad iOS 4 Views, Windows and the View Hierarchy (Xcode 4) before proceeding. In the remainder of this chapter we will work through a self contained example. 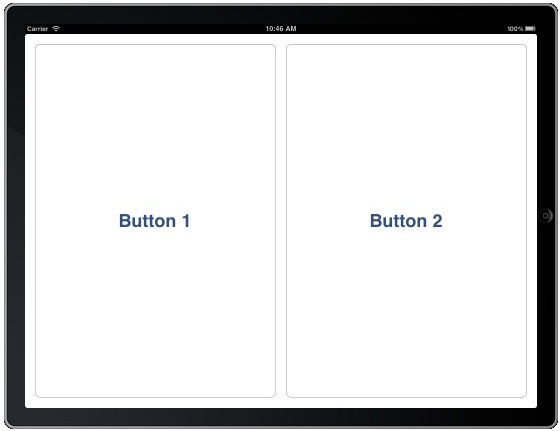 To set up this example, start Xcode and create a new iOS View-based iPad project named layout. From within Xcode project navigator panel, select the layoutViewController.xib file and create a simple interface consisting of a single button object. In terms of screen resolution, for both the first generation iPad and the more recent iPad 2 the overall window size is 1024 pixels high by 768 pixels wide in portrait mode and, of course, 768 pixels high and 1024 pixels wide in landscape. Keep in mind that if the application displays the standard status bar the actual display space available will be reduced accordingly. The iOS app templates for the iPad provided by Xcode automatically assume that your application will sensibly support rotation. Despite this default behavior, it is not a given that every app should support rotation. If there is nothing to be gained in terms of the user experience by supporting both landscape and portrait layouts of your iPad application’s user interface do not feel compelled to implement this capability. When the iPad detects that it has been rotated to a new orientation a call is made to the shouldAutorotateToInterfaceOrientation method of the view controller instance. In order to control rotation support it is necessary to modify this method in the currently active view controller for your application (in the case of our example this is the layoutViewController class). If you are testing your iOS applications natively on a physical iPad device, you can simply rotate the device to test the behavior of your application. If, on the other hand, you are running the application in the iOS Simulator, you can simulate rotation by selecting the Hardware -> Rotate Left and Hardware -> Rotate Right menu options. In order to make the handling of orientation changes a little easier to implement, the UIView class from which visual components are derived provides a feature called Autosizing. Autosizing allows us to define on a view by view basis how a subview will be resized and positioned relative to the superview in which it is contained. These settings can be defined programmatically in code or from within the Size Inspector of the Interface Builder tool during the user interface design process. Here we see a classic example of the implications of enabling rotation in an application without taking the additional steps to reformat the view to match the change in orientation. Having rotated the device, only the top button is visible and it is still centered assuming that the device is in portrait mode. The second button is similarly positioned, resulting in it being outside the viewable area of the screen. These two settings correspond to the UIViewAutoResizingFlexibleHeight and UIViewAutoResizingFlexibleWidth autoresizing mask properties. When multiple autosize attributes are set on a single axis (for example flexible left and right margins combined with flexible width) the resizing is distributed evenly over each dimension. Whilst the autosizing features will work for many situations there are some limitations. It is quite possible for example that you will want to change the entire layout of your user interface depending on whether the device is in portrait or landscape orientation. This might involve not only changing the size of view elements but also moving them to specific locations on the screen. Clearly this is beyond the capabilities of autosizing. A useful approach to this situation involves intercepting the rotation of the device and changing the position and dimensions of the user interface components before the screen is redrawn. In order to achieve this we will need to override the willAnimateRotationToInterfaceOrientation method of the UIViewController class. This is the method that gets called just before the user interface begins to rotate. As mentioned previously, the willAnimateRotationToInterfaceOrientation method gets called just before the user interface rotation takes place. Passed through as an argument to this method is the new orientation of the device in the form of the toInterfaceOrientation variable. Within the body of the method we identify if the device has rotated to a landscape or portrait orientation. Using the CGRectMake method (which takes x, y, width and height as arguments) we create a CGRect structure containing the new co-ordinates and dimensions for each button and assign them to the frame property of the button instances. When the method returns, the system will then proceed to draw the buttons using the new frame information that was configured in the overridden method. Rotating the device back to portrait orientation should trigger the second part of the if .. else .. construct in the overridden method, thereby returning the buttons to the original layout.